Above is a brief overview of how this pattern works. Starting in the top left, the user accesses the Create action. 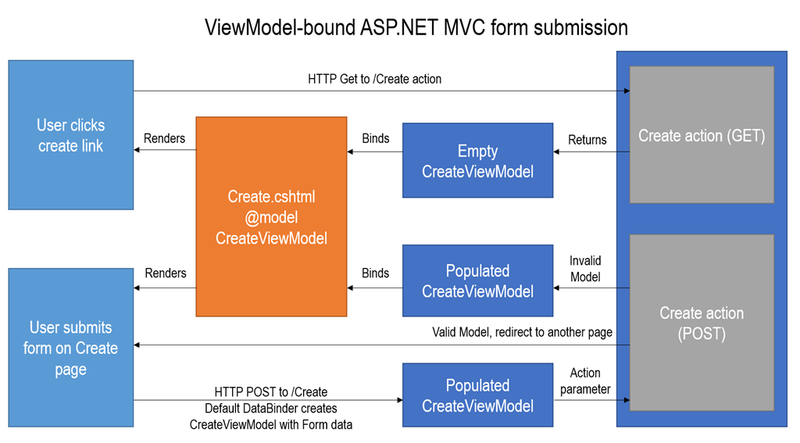 The Action method provides a new CreateViewModel object to the Create.cshtml view, which renders the Form using the data in the ViewModel. 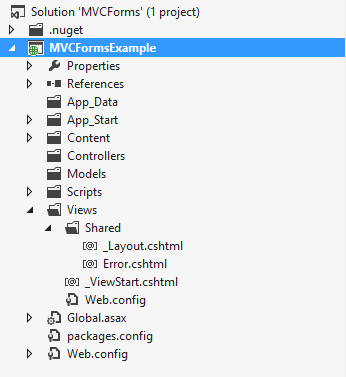 When POSTing the form back to the Controller, the default ASP.NET MVC DataBinder maps the POSTed Form values to Properties on the ViewModel class and provides it as a parameter to the HTTP POST overload of the Create action. Depending on the validity of the model, the POST overload of the Create action returns the same form back to the user (showing the validation errors), or redirects to another page. Note how at this stage, this is a simple POCO class with no business logic. This could be a domain model in the Models folder and map to an ORM directly but for all except the most simple use cases, preparing a ViewModel for presentation purposes works out to be more flexible in the long run and less coupled to your database design, which might be a legacy database. 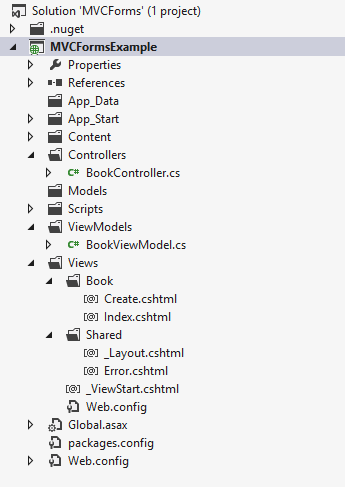 Next, add a Controller, BookController.cs in the Controllers folder. Following the flowchart above, we create two actions, Index and Create, with a Post overload for the Create action that accepts a BookViewModel parameter. This method must be marked with [HttpPost] to tell the MVC framework to use this for POST requests (otherwise the route would be ambiguous). As above, this checks that the ModelState is Valid, redirects to Index if it is and returns the same ViewModel to the View to render validation errors if not. We start with using Html.BeginForm, which wraps the containing markup in <form> tags. The default HTTP method is POST and the default Action to post to is the same as the current route – in this case Create. For the Id field, we only use the built in Html.HiddenFor helper since we don’t want to display it. 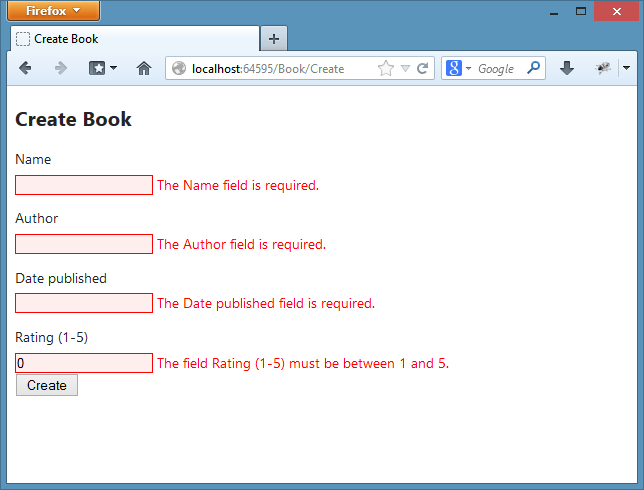 For the remaining fields of the BookViewModel, we need to use Html.LabelFor, Html.EditorFor and Html.ValidationMessageFor, including some HTML markup to put each div on it’s own new line (the CSS is included with the “Basic” template). Finally a submit button will POST the form. You can also click Create. 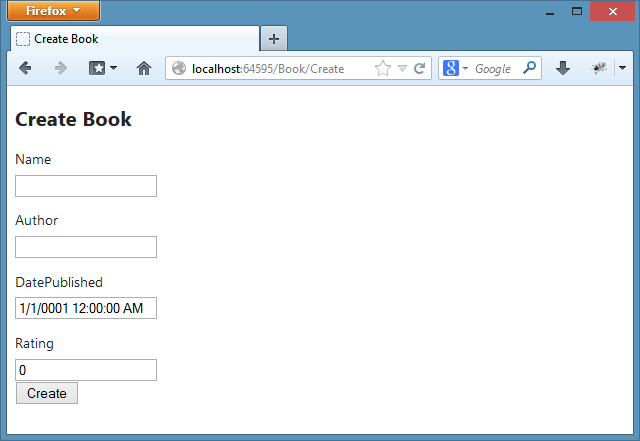 Because the data on the form is Valid, it will redirect to the Index page. The data is not valid of course, so we need to add some Validation. By correcting the errors, the form will submit and redirect to the Index action. Part 1 here has shown you how to bind a View Model to a form in ASP.NET MVC, along with some basic Validation rules being applied. In Part 2, I’ll walk through persisting the data in temporary memory and creating the Edit action. Thanks Ed, great tutorial, it solved a lot of questions I had and you kept it short and concise, cheers. Nice tutorial, the viewModel term has been bugging me for nights. What makes it confusing are the people who makes comments to forums saying different things. Well,sometimes it’s just these little things that gives us headaches. hahah . I hope to learn more from you. Keep up the good work. More power! Thanks! It is really concise, helped me a lot! Thanks for the nice writeup. Is it typical to include the DataAnnotations on both the model and the viewmodel? It seems kind of redundant to me to declare all of the fields in the book model (in your subsequent tutorials) and then again in the viewmodel. Why can’t we just pass an instance of “Book” through the viewmodel instead of repeating all of these fields? An explanation would be great!! Thanks for the help! You can pass it straight through if you want. I have however found from experience that not passing the domain model through to the form allows more flexibility. I read a lot of examples, but this is the only one, after which my code can run. Thanks for this excellent post. Very well explained, and helped me a lot on my journey with adopting the MVC pattern. This is a simple Model class, not a ViewModel. There is a major difference between the two…..
Yeah, this confused me too, doesn’t this “ViewModel” have a 1:1 mapping to the underlying “Model”? I.e. it isn’t a ViewModel! Thanks a bunch! This helped my understanding of View Models in particular. In my understanding, a viewmodel can actually have the exact same properties as the model it is representing, another facet of the viewmodel is the abstraction it provides. Obviously, a viewmodel may also contain other properties from other models, or some type of computed property as X and Y allude to above but there other benefits of using a viewmodel. Thanks for the great article. 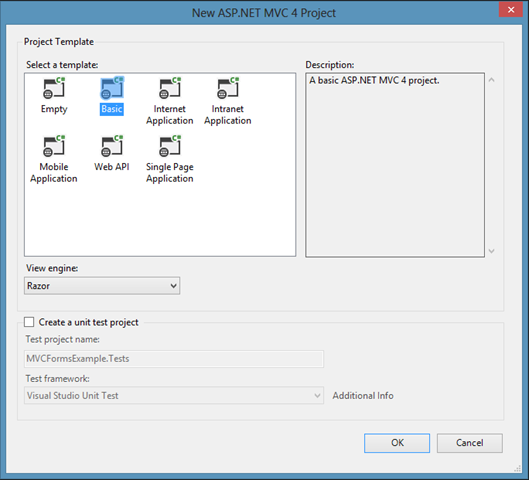 Sorry, Ed, I’m quite new to ASP.NET MVC,so some questions arise. In your ViewModel you’ve got the property “Id”, which holds the attribute “required”. But input field for this property does not exist. How is it filled? And also, what are key attributes in your viewmodel? Thanks in advance.